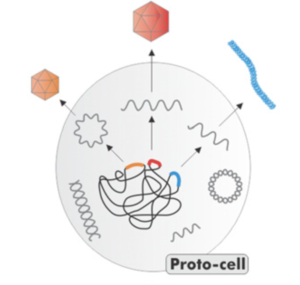 Plasmids have been discovered that can move from cell to cell within membrane vesicles in a species of Archaea (link to paper). They provide clues about the origin of virus particles. Electron microscope analysis of the culture medium from Halobrum lacusprofundi R1S1, an Archaeal strain from Antarctica, revealed spherical particles which were subsequently shown to contain a 50,000 base pair circular double-stranded DNA molecule. When added to H. lacusprofundi, the purified membrane vesicles entered the cells and the DNA replicated. Nucleotide sequence analysis of the plasmid within the membrane vesicles revealed 48 potential protein coding regions and an origin of DNA replication. None of these proteins showed any similarity to viral stuctural proteins, leading the authors to conclude that these particles are not viruses. Many of the proteins encoded in the plasmid DNA were found in the membrane vesicles. Some of these are similar to cell proteins known to be involved in the generation of membrane vesicles. However no DNA polymerase-like proteins are encoded in the plasmid. These data suggest that the plasmid encodes proteins that generate, from the membranes of the cell, the vesicles needed for their transport to other cells. However, replication of the plasmid is carried out by cellular DNA polymerases. It is likely that the plasmid-containing membrane vesicles are precursors of what we know today as virus particles. It is thought that viruses originated from selfish genetic elements such as plasmids and transposons when these nucleic acids acquired structural proteins (pictured; image credit). Phylogenetic analyses of the structural proteins of many enveloped and naked viruses reveal that they likely originated from cell proteins on multiple occasions (link to paper). The membrane-encased Archaeal plasmid seems well on its way to becoming a virus, pending acquisition of viral structural proteins. Such an early precursor of virus particles has never been seen before, emphasizing that science should not be conducted only under the streetlight.